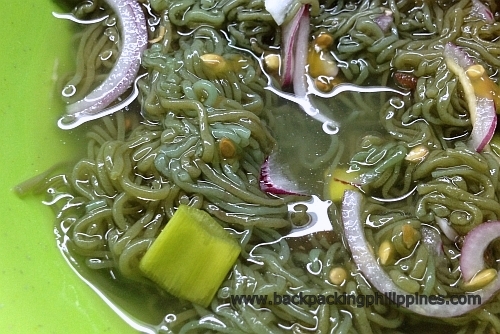 Backpacking Philippines: Visayas Delicacy: Kilawin Lukot (Donsol Sea Hare Secretions) is Like Green Pancit! 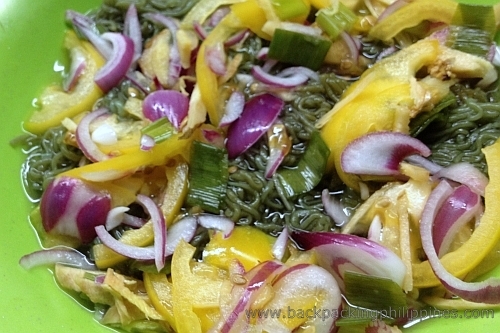 Visayas Delicacy: Kilawin Lukot (Donsol Sea Hare Secretions) is Like Green Pancit! One of Tutubi's favorite questions he asks his friends in several places is this: "what is your place's specialties, delicacies that's only here and not in Manila?" He popped this question successfully in several instances and sometime got no answers, some were delayed responses. In most places, the people Tutubi spoked with were not aware of the things, places and traditions that they take for granted but may be highly sought after by others. And even though Bohol is not new to Tutubi, as he's been there for about 4 times already, he again asked the question to a local and here's her reply: "try Lukot," it looks like green pancit or green spaghetti (actually like green angel hair pasta to be correct). then he remembered it featured way back on GMA7's Kapuso Mo, Jessica Soho. Lukot, has almost the same green color as the guso and lato, both seaweeds, but it's not seaweed, it is actually secretion of the sea hare (known in the Visayas as donsol) but not waste or poop, that form like green noodles that's why it's sometimes called marine spaghetti. The hunt for lukot brought them, not the nearest beach in Bohol to gather lukot, but to Mira Villa Seafood Restaurant in Tagbilaran City to sample the "exotic" delicacy known as lukot (exotic for Luzon denizens like Tutubi). How does lukot actually taste like? texture? It's not slimy nor even have a distinct smell (maybe partly because the vinegar in the kinilaw drowned the smell) and smooth, soft texture but if you have a bad imagination it may feel like chewing/swallowing a worm. Tutubi can't actually describe it but it's good. Better taste it yourself and find yourself say: kalami gyud!